NIC Components is pleased to announce the addition of NPYT series of Y2 class Safety Capacitors to its expanded family of leaded (LDD) high performance safety film capacitors. 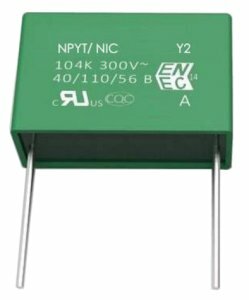 NPYT series expands upon the NIC established X class of safety capacitors (X1, X2), covers capacitance value range of 1000pF to 0.1uF, in 300VAC voltage rating. NPYT series is designed for use connected between Line(L) or Neutral (N) and Ground (G) in North America, and between L-1 or L2 and Ground in Europe, to suppress common mode interference (EMI). NPYT series utilizes metallized polypropylene film with non-inductive & self-healing wound element construction, for stability under VAC operation, and safe end-of-life failure mode. Y class capacitors suppress common-mode noise (EMI) produced by electronic equipment, preventing the escape of EMI, via the AC line, to connected equipment. Y class capacitors protect users from electrical shock potential, so component reliability is a key requirement. NPYT series feature wide operating temperature range of -40ᵒC to +110ᵒC and high withstanding voltage capability of 2000VAC or 4000VDC. NPYT series have safety agency listings with UL, cUL, ENEC, CQC for use in line bypass applications. Molded box type construction meets UL-94V-0 flammability test. NPYT series is RoHS compliant, with Pb-Free finish, and has unit pricing ranging from $0.06 to $0.15 in production volumes. Contact NIC Components today for free samples, or to review your circuit requirements..